This weeks tip will take care of these small make-up meltdowns most of us encounter at least once especially on the summer months. When it get’s hotter, your skin can be a bit oilier than other times and this can effect your make-up. Here are some small tips to keep the shine away. 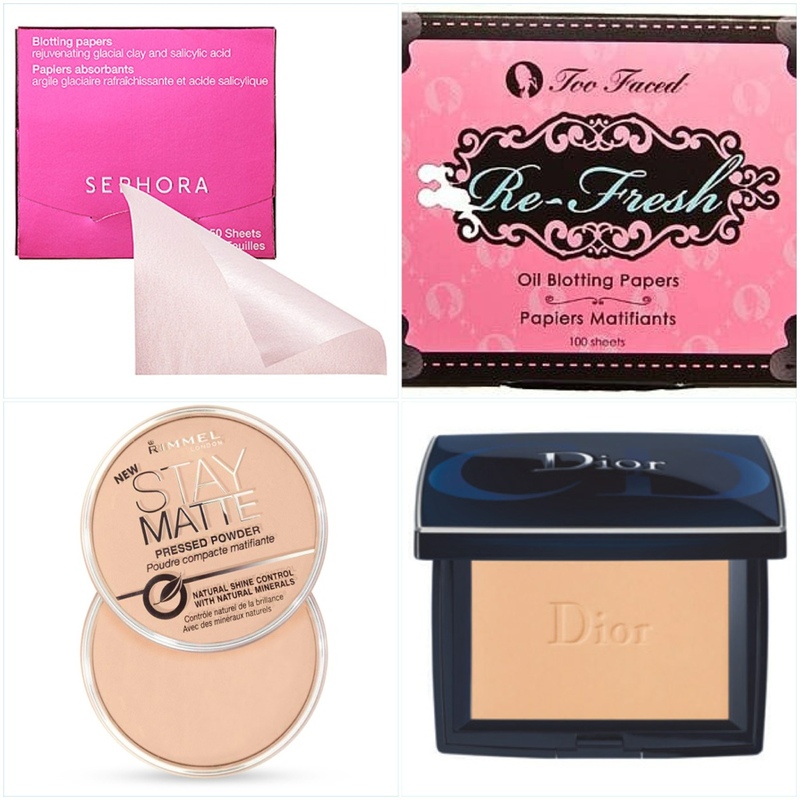 If you don’t want to carry to much make-up products with you, blotting paper is your ideal friend. When your skin is a bit shiny, just use the blotting paper to take off the excess oil on your face. Another tip concerning the blotting paper is that you can use a toilet seat cover, they consist of almost the same texture than blotting paper. So that can be useful when you don’t have any blotting paper on you and you need to touch up your make-up. Left to right, top to bottom: Sephora blotting paper, Twoo Faced blotting paper, Rimmel Stay matte pressed powder, Dior pressed powder. A second tip is for those who do carry make-up with them. You can touch up your make-up using a powder. If you want one that helps keep the shone away, you can use a mattifying one. I wouldn’t recommend to cover your whole face in powder multiple times a day. You just use a small brush to put the powder on the places that are more oily at that moment. You can use both a loose powder or a pressed powder for this. I prefer a pressed powder because you sometimes can use a bit to much product when using a loose powder. This entry was posted in beauty and tagged beauty, blotting paper, make-up, Meltdown, pressed powder, tips by missnathaliexo. Bookmark the permalink.